I decided that this year I would really like to start blogging more on this crazy journey of self-employment and wedding business life! What better way to start the year than with a recap of 2018 and a look over a selection of some of my best bits and favourite images from last year. It’s been so enjoyable compiling this post, looking over my wonderful clients beautiful bespoke wedding dresses and one-of-a-kind outfits that I have loved designing as well as all the amazing shoots I have had the pleasure of being a part of and the incredible wedding suppliers I have had the chance to work and collaborate with. I have picked a few of my favourites, but really there are so many I could have included! First up I loved looking back over the Ultra Violet shoot I was involved in which was to celebrate the 2018 pantone colour of the year. I got to work with some truly talented suppliers who I have gone on to do more exciting collaborations with since. Frances & Rose picked the most incredible colours for her flowers and the results were truly stunning. The dress used was the Willow Lace dress from my Collection and was worn over the Hazel backless silk slip. One of my favourite bespoke wedding outfits of the year to create was for Katt which she wore for her Scottish wedding to Jamie. I designed a unique guipure lace jacket for Katt to compliment her bias cut gown which was actually inspired by her own leather jacket to help her truly feel herself on her wedding day. You can read more about Katts dress and see more pictures from their awesome day over on the brides section of my website. This shot was from Katy & Carls Sheffield Wes Anderson inspired wedding at Abbeydale picture house. It shows the detail of the bespoke embroidery I added to Katy’s veil with their initials and their wedding date. Personal touches like this are what can add such a special touch to your day and be something you can treasure for years to come. See more of Katy’s wedding over on my Brides page. This incredible image is from a super stylish elopement shoot I was asked to supply a dress for. It was directed by Agnes Black and included some brilliant creatives to pull it all together. The dress featured was my Bay high-low hem dress in satin spot fabric, this dress is part of my bridal collection and can be made in plain silk or even lace, it’s so versatile and would make the perfect elopement style! 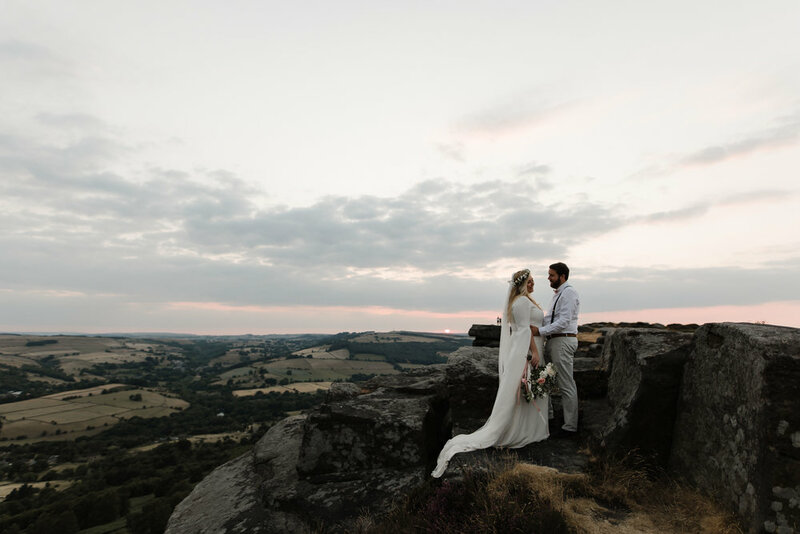 I absolutely adore this image of my real bride Lauren and her husband Lee in the Peak District. Lauren's dress was completely bespoke and created to her vision using inspiration from her mum’s own wedding dress. I adored creating Laurens outfit as well as her unique veil that had over 150 hand cut silk flowers embroidered onto it, it was simply beautiful. You can read more about Lauren’s gorgeous wedding and bespoke dress over on my brides page. This stunning shoot was held at the beautiful new Sheffield venue The Mowbray where a fabulous group of creatives came together under the co-ordination of Marianne from Frances & Rose to create some true magic and celebrate autumn, depicted so beautifully in the seasonal florals used by Frances & Rose. Beautiful bride Sarah approached me to design and create a bespoke bias cut gown for her wedding which I loved designing for her with its plunging back and delicate lace trim. You can see more from Sarah’s wedding on my brides page. 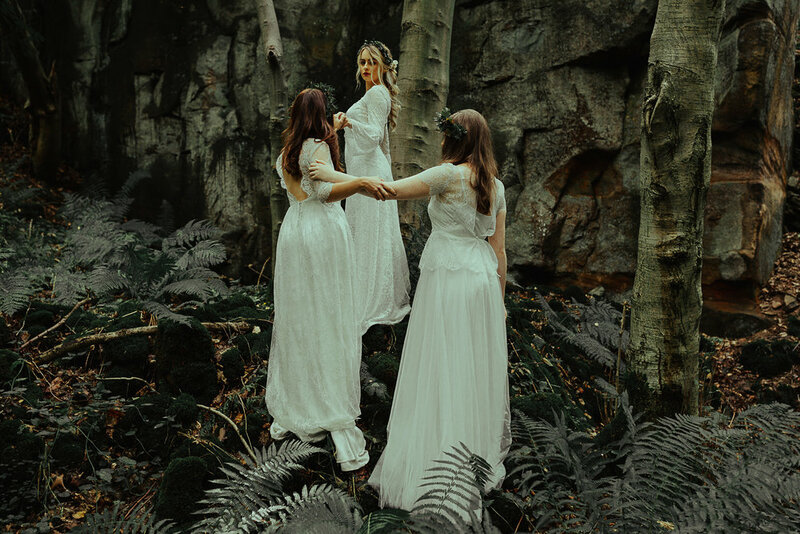 In the summer I collaborated with some local Derbyshire and Matlock based Wedding suppliers on a shoot based around the film and Tv adaption, Picnic at Hanging Rock. We went to a disused quarry and the backdrop suited my dresses perfectly highlighting their dreamy and ethereal vibes. You can see more of the images of my collection used in this shoot here. Finishing the year off and to brighten a bleak winter I was asked to be involved in this beautifully colourful shoot at Beeston walled gardens. The colours were just incredible and the perfect backdrop for my Magnolia dress. Looking over the past year has got me so excited for 2019 and all the amazing clients and projects I have to work on! I can’t wait to create some bridal magic with my bespoke clients as well as some beauty with the styled shoots I have coming up. Keep your eyes peeled as I hope to document this year much better!